We’ve probably all wondered why it is necessary to “clap” that black and white thing before the shooting of a new scene in the movies. Who thought of it? How? Why would anyone think of such an object? The clapper (also known as a slate, skateboard, clacker, clapsticks, clapper board), was invented sometime during the early 1920’s. In the early days of film, one person would hold a slate for the camera with the scene information, while another clapped two hinged sticks together in front of the camera. The combination of the two into one unit made it possible for one person to perform both tasks. The sound was just being introduced to film, and filmmakers needed a way to synchronize sound with film. Striking the sticks would create a clap sound that would be recorded and later synchronized with the visual film allowing the picture and sound to run in sync. If each scene is tagged at the moment of filming with sufficient identifying information in both visual and audio form, then the film editor does not need to waste time guessing which film clips go with which audio recordings. 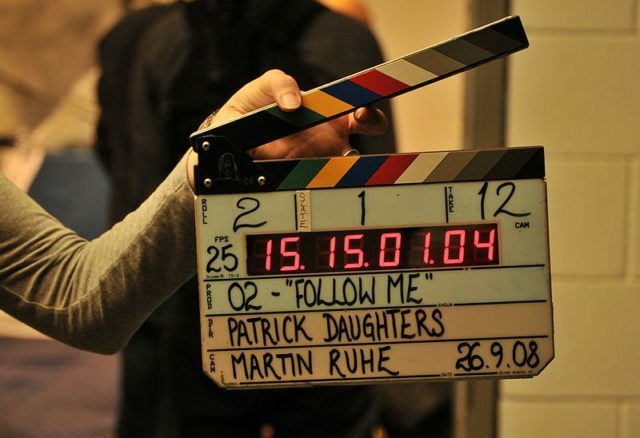 Traditional clapperboards consisted of a wooden slate and a hinged clapstick attached to the top of the slate. 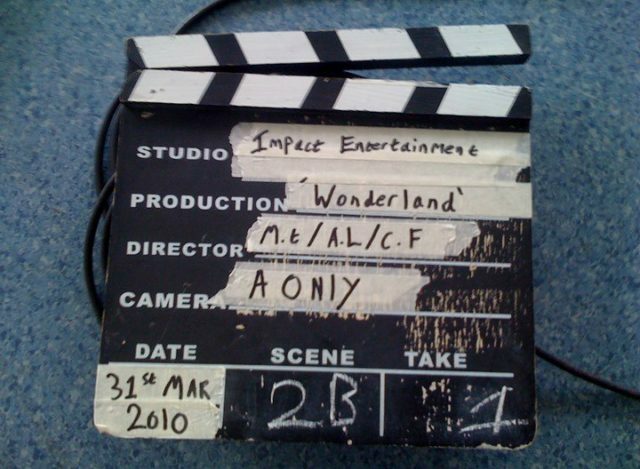 Modern clapperboards generally use a pair of wooden sticks atop whiteboard or translucent acrylic glass plates which do not require additional lighting from the camera side to be legible. The slate bar is often painted in stripes to make it stand out from the background and make the editor’s job easier in finding the exact frame to match audio or multi-camera footage. In recent years sticks with calibrated color stripes have become available. 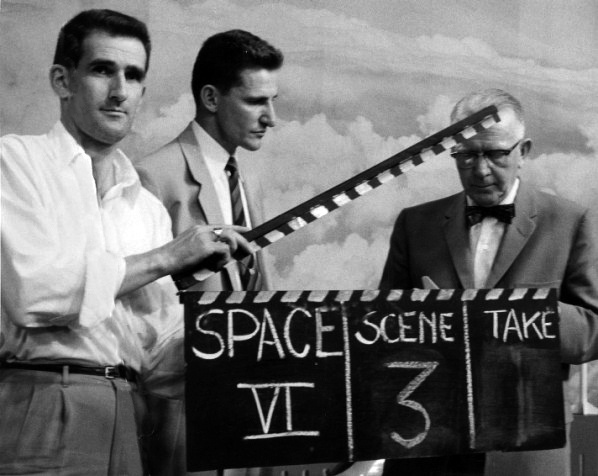 In some productions, particularly those created in the digital domain, electronically superimposed versions of a clapperboard have supplanted the real thing. 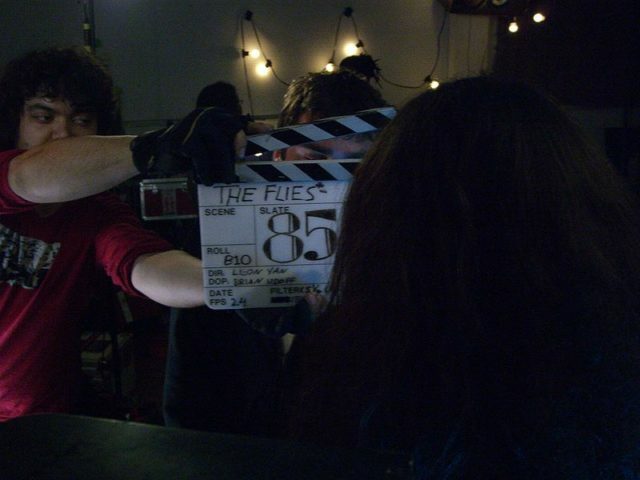 In use, the details of the next take are written on the slate of the clapperboard. European: slate number, the take number (with the letter of the camera shooting the slate if using multiple-camera setup); e.g. slate 256, take 3C. The clapper (two sticks hinged together) was invented by F. W. Thring (father of actor Frank Thring), who was head of Efftee Studios in Melbourne, Australia. It is worth noting that Efftee was not founded until 1931, not in the 1920s as sometimes stated. However, the date of Efftee’s founding does not assume the start of F.W. Thring’s involvement in the industry. The beginning of the Australian film industry is considered to be 1906’s “The Story of the Kelly Gang,” which was the first feature length narrative film in the world. The director of this film, Charles Tait, was associated with J. C. Williamson. The former’s production company, J. & N. Tait, merged with the J. C. Williamson Film Company, of which F.W. Thring was managing in 1918. The clapboard with both the sticks and slate together was refined by Leon M. Leon (1903–1998) a pioneer sound engineer.